Pope Francis pulled off some cool basketball moves in Vatican’s St. Peter’s Square at his general audience on Wednesday. He was encouraged by visiting US basketball team the Harlem Globetrotters, who made the Pontiff an honorary member. The pontiff is known to be an ardent fan of football, especially of his Argentinian home team. However, on Wednesday the Pope showed interest in basketball at his general audience on St. Peter’s Square as he met with the famous entertainment basketball team. The Pope was walked through how to spin a ball on his fingertip and encouraged to try the move. He was also presented a jersey of an honorary member of the team adorned with the name Pope Francis and the number 90 on the back. Only nine people, including Pope Francis, former Pope John Paul II and Nelson Mandela, have been given the honor by the Globetrotters. 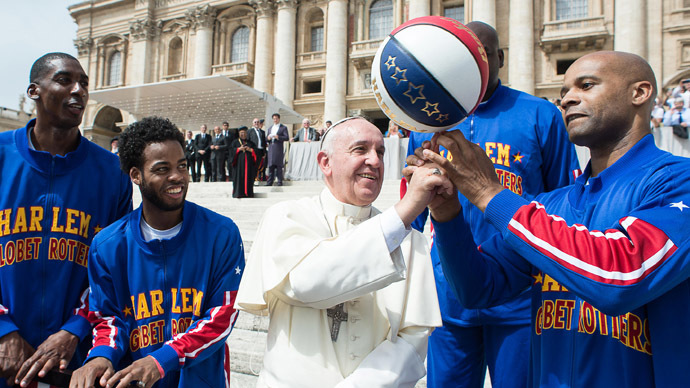 The Globetrotters stopped in Vatican on Wednesday as part of their Italy tour. The American exhibition team was founded in 1926 and over the years has played more than 20,000 games in 120 countries. The Globetrotters are claimed to be the first professional basketball team.